It is not a secret that Samsung deliberately avoided QLC NAND with its 64-layer V-NAND flash, in the process citing various reasons. With its 96-layer V-NAND however, the company is changing its approach and is going to offer QLC-based SSDs for client and server computers. 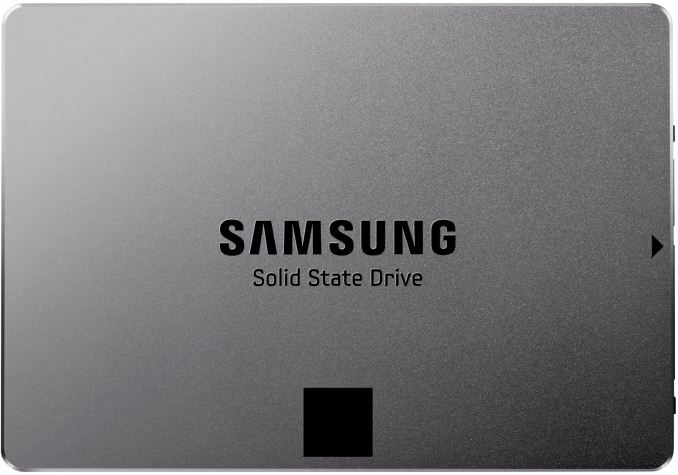 At the Samsung SSD Forum in Japan the company disclosed the first details about the upcoming drives. The key advantage of 3D QLC NAND over 3D TLC is of course a 33% higher storage density and therefore a lower per-bit storage cost (assuming a similar yield). Therefore, the first drives to adopt Samsung’s 3D QLC V-NAND will be high-capacity SSDs for those customers who need to store a lot of data and may not be that interested in the maximum performance. Samsung has been openly working on ultra-high-capacity SAS/U.2 SSDs based on QLC V-NAND memory for well over a year now. These drives will be used for WORM (write once, read many) applications not optimized for fast writes, but clearly outperforming HDD-based arrays. Samsung expects its first QLC-powered NVMe drives to offer up to 2500 MB/s sequential read speed as well as up to 160K random read IOPS, significantly outperforming high-end 10K RPM HDDs. Evidently, high-capacity QLC-based SSDs are supposed to substitute multiple 10K RPM hard drives working in a RAID array, so comparing performance of a single SSD to a 2.4 TB HDD may not be too representative, especially when power consumption is taken into account. Another lineup of Samsung’s products to use 3D QLC V-NAND will be client SSDs featuring capacities higher than 1 TB. These drives will use a SATA interface and will offer sequential read and write performance of around 520 MB/s (when SLC write caching is enabled), according to details that Samsung disclosed at its SSD Forum. 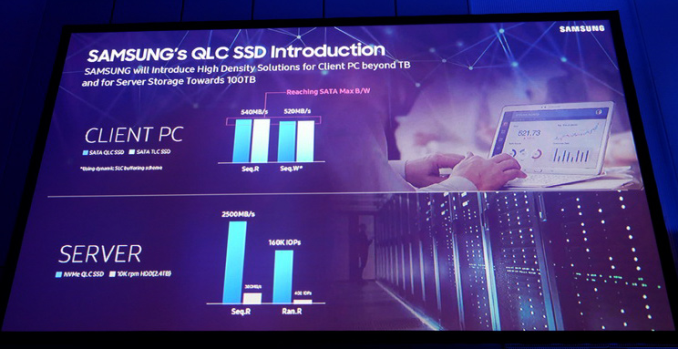 Samsung does not disclose when such drives are set to become available, but the company says that Terabyte-class client SSDs will become mainstream in 2020 because of QLC V-NAND. In the meantime, Samsung does not expect QLC V-NAND to replace TLC V-NAND as the mainstream type of flash memory any time soon. QLC NAND requires more expensive controllers with considerably higher processing capabilities to guarantee a proper endurance. Therefore, the low-cost per-bit advantages of memory may not be that obvious on client SSDs. Hey Samsung, no need to tarnish (SSD) brand name with QLC trash. Everybody will go down the QLC route. Just like they went from SLC to MLC to TLC. It's cost effective, it will have a real-life reliability close enough to everything else on the market now, and it's the most accessible way of fulfilling the ever increasing need for capacity. For most consumers a halfway decent QLC design will be more than adequate for the life of their device, and it's a CRAPLOAD better and more reliable than a consumer-grade spinner. So if they can get densities up and prices down, I'm all for 96+ layer QLC for mainstream consumer systems - especially entry-level laptops! After several years with my SSD I think I am at 5. Yup, that two orders of magnitude still to go. Nonsense, I want my cosplay pics on fast Optane storage because they NEED to be accessible as quickly as possible as my whims dictate!